The Jimny looks absolutely brilliant and commands plenty of attention everywhere it goes, plus it’s a genuinely capable off-roading tool. And it that’s all you’re looking for, you’ll absolutely love it. However, most people considering cars like this are looking for an SUV rather than an off-roader – in other words, they just want the rugged look rather than the mud-plugging ability - and for those people, the Jimny doesn’t make so much sense. Those buyers will be better off with a more conventional small SUV, most of which are more comfortable, more practical, more civilised and better on quality and safety. Flawed, but still very charming. Most small SUVs are given chunky looks purely for show, but with the Jimny, the off-roader styling cues are there because this is a proper off-roader, making them functional rather than just a bit of fun. The jacked-up suspension gives you decent ground clearance, while the short overhangs at either end give you better clearance when approaching - or driving away from – an obstacle. Meanwhile, the upright design, round headlamps extended wheel arch covers and small bumper-mounted rear light clusters are more than a little reminiscent of the hulking Mercedes-Benz G-Class, and off-roaders don’t come much more rugged than that. The entry-level SZ4 model has 15-inch steel wheels and black plastic finishes for the door handles and mirrors, while the SZ5 model has 16-inch alloys and replaces the black bits with body-coloured ones. It also adds rear privacy glass. 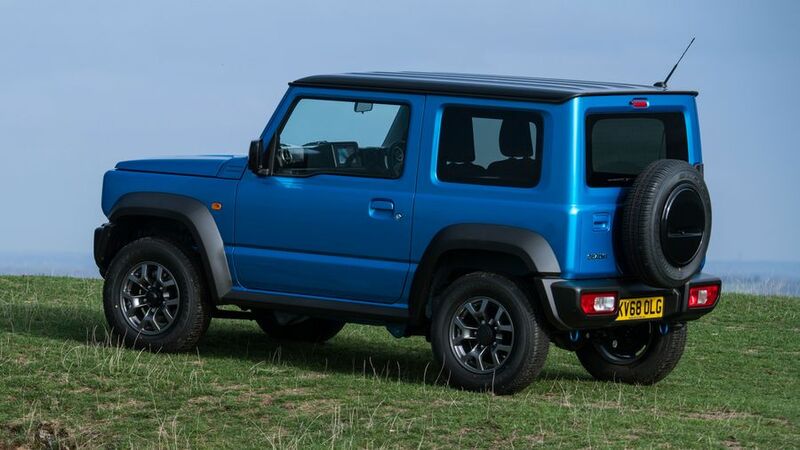 Whichever model you pick, though, the Jimny looks great and receives plenty of attention. The Jimny looks and feels just as rugged on the inside as it does on the outside. 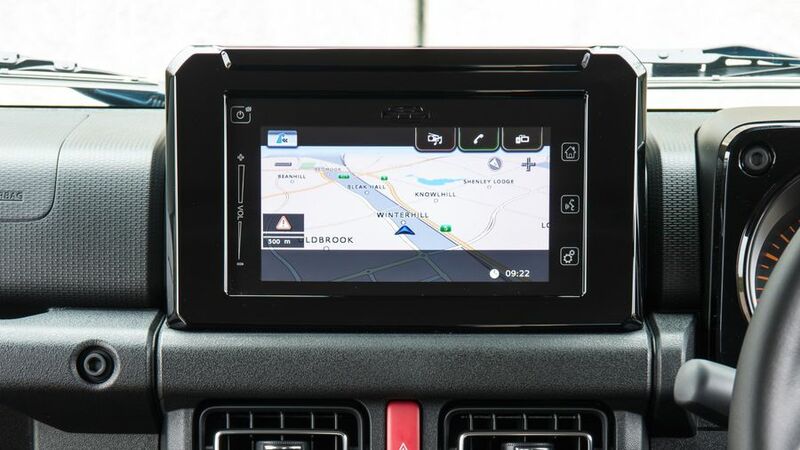 The upright dashboard is simply and logically laid out, with chunky, easy-to-hit buttons, and there’s a grab rail on the passenger side for when the terrain starts flinging you around in your seat. 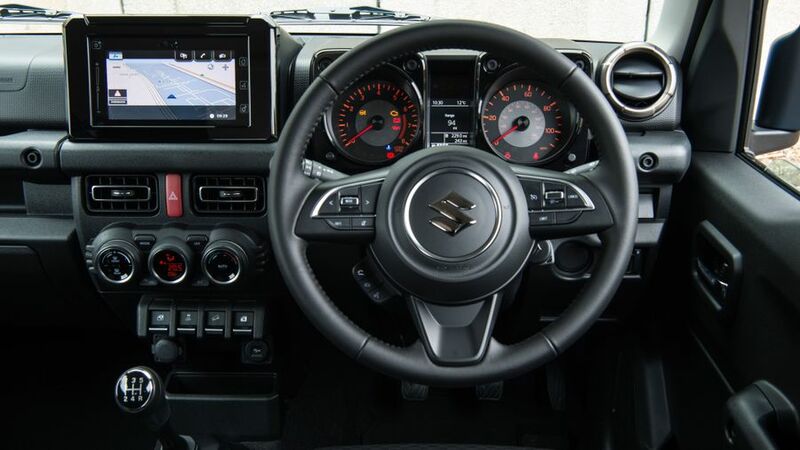 In the top-spec SZ5 model, you’ll notice that the touch-screen infotainment system is the same one found in other Suzuki models, and while it’s not the slickest or most intuitive system you’ll come across, it’s reasonably straightforward to get to grips with and includes Apple CarPlay and Android Auto. The SZ4 gets a more rudimentary CD player and radio combo, although it does include Bluetooth and DAB. On quality, the materials used are tough rather than tactile, with a hard, wipe-clean finish, but they do give the car a solid, robust feel. 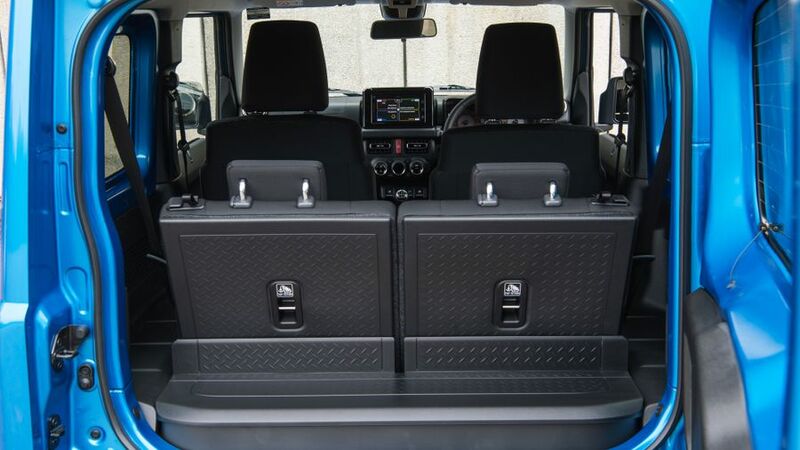 The massive windows and thin pillars mean you get plenty of natural light and great visibility in all directions, even though the boot-mounted spare wheel does cut into your rear view slightly. However, the narrowness of the cabin does make it quite easy to bash your elbow on the window sill as you fling the steering wheel around, and the steering wheel only adjusts for height (not reach). What’s more, there’s no height adjustment on the seats, so finding a comfy driving position may prove even trickier. The Jimny’s performance in this area much depends on your expectations. What with its chunky styling, it’s easy to forget that this is an extremely small car, and yes, you’re going to be much better off with a more conventional small SUV if you regularly carry people and luggage. Especially since you can’t really do both with the Jimny, because the boot is so minuscule (just 85 litres) with the rear seats in place. That means it’s not a great family car. 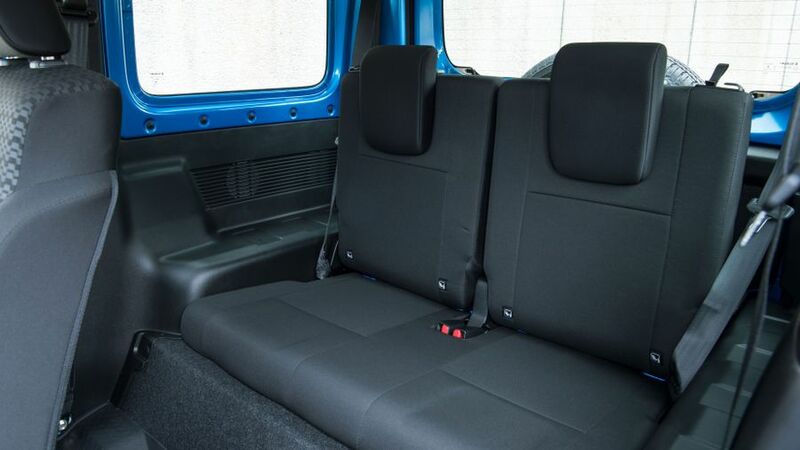 However, there’s a much more generous loadspace (377 litres) when you fold the seats down, and you get a completely flat floor that also happens to have a wipe-clean plastic finish. The side-hinged tailgate can be awkward to open in tight parking spaces, but it does give the Jimny a very wide boot opening. Considering the dinkiness of its dimensions, it doesn’t do too badly for passenger space with all the seats in place, either. The boxy design means there’s loads of headroom in any of the four seats, and there’s enough legroom in the back to fit a six-foot adult behind a similarly-sized driver in reasonable comfort. The low-set rear seat does mean you sit with your knees rather high, and you’ll have to combine dexterity and determination to clamber back there in the first place, but once you’re in, it’s fine. In the pursuit of off-roading excellence, the Jimny is quite unconventional compared with your average passenger car. Not only does it have four-wheel drive and low-range gears to help with traction in the sticky stuff, but it also has an old-fashioned ladder-frame chassis and even older-school rigid-axle suspension both front and rear. This pays big dividends on uneven ground, but makes for a pretty uncivilised life on the road. There’s a constant tremor through the floor on any surface that’s less than perfect, so it isn’t as comfortable as most more conventional small SUVs. That said, the tremor isn’t as pronounced as it was on the previous Jimny, and bigger bumps and potholes don’t give you quite the same whack in the backside (although to be honest, it’s not far off). The handling is as roly-poly as you’d expect from a car with soft suspension, high sides and a small footprint, so you’ll feel lots of body lean in bends. The steering is very slow as well. 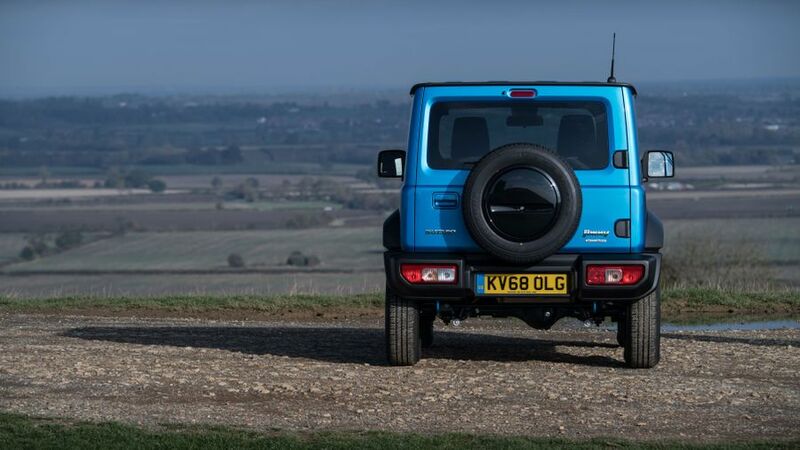 Importantly, though, the tyres provide lots of grip and traction to keep things secure, and you don’t buy a car like the Jimny for its sharpness anyway. There’s no choice when it comes to the engine you have in your Jimny; there’s a 101 horsepower 1.5-litre petrol engine, and that’s it. Predictably, it’s not exactly a ball of fire when it comes to piling on the acceleration, but bearing in mind the limited handling ability we just talked about, you really wouldn’t want it to be. Importantly, the engine will have enough pep for most people who buy a Jimny, and it should provide enough torque to pull you out of the odd sticky situation when you venture off the beaten track. Put the Jimny on a motorway, though, and things aren’t so positive, because the short gearing means the engine has to work quite hard at the national speed limit, which makes life rather noisy. What’s more, the engine has a rather thrashy sound that’s more reminiscent of a three-cylinder, despite it actually being a four-cylinder. The five-speed manual gearbox is a wee bit notchy at times, and sometimes fails to engage a gear at the first attempt. The lack of a sixth, cruising gear means that it sits at high revs at motorway speeds, and is consequently pretty noise. 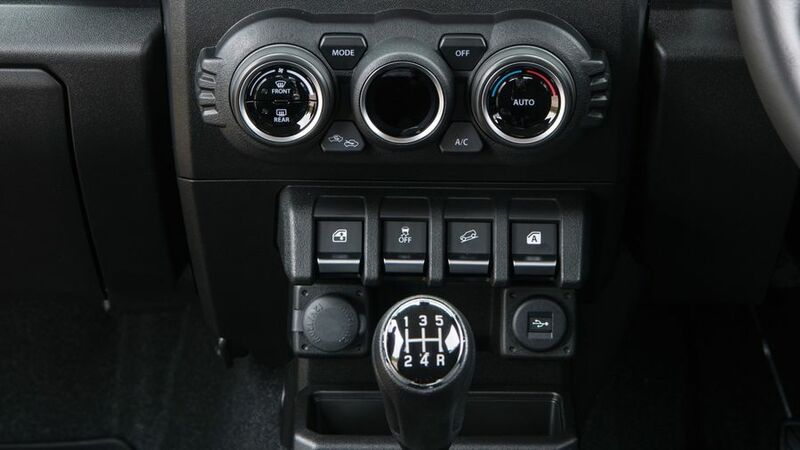 You can also have your Jimny with a four-speed automatic gearbox, but we’ve yet to try it yet. The Jimny's appeal has always been that it’s a cheap way into a proper off-roader, and the latest version is a bit pricier than the model that went before it. Having said that, it’ll still cost a fraction of what you’ll pay for something with comparable off-road ability. Finding direct rivals is quite tricky, as it's such a niche proposition, but the four-wheel drive Dacia Duster is another off-road capable, cheap SUV, albeit one that's not so gifted away from the road. 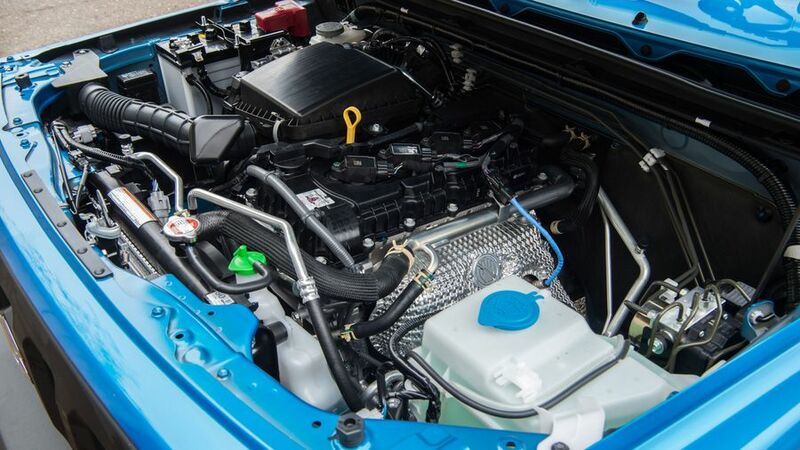 Although the Duster is several thousand less than the Jimny to buy, it doesn't get quite such good fuel economy and probably won't hold its value as well as the Suzuki. Despite that, we suspect that - depending on which model you go for - the Duster will cost slightly less in terms of overall bills. Things look good on this score. 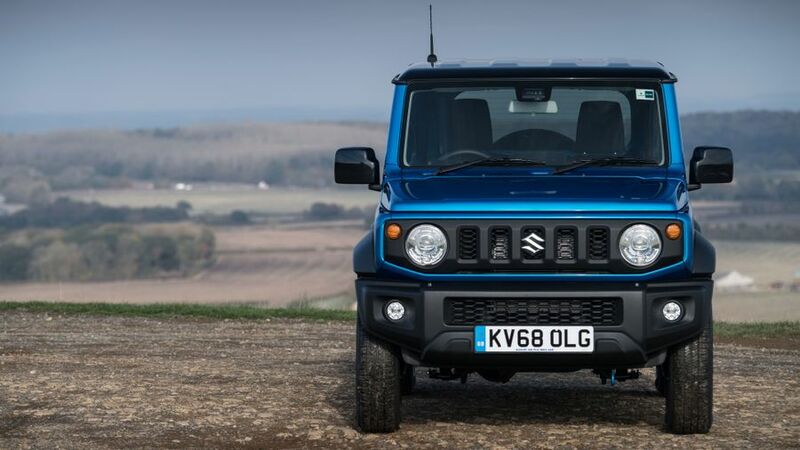 Suzuki sits very near the top of the manufacturer standings in Warranty Direct’s Reliability Index, and the Jimny has a very good score as an individual model as well. It sits comfortably inside the study’s Top 50 models. JD Power's 2018 Vehicle Dependability Study put Suzuki second overall among manufacturers. 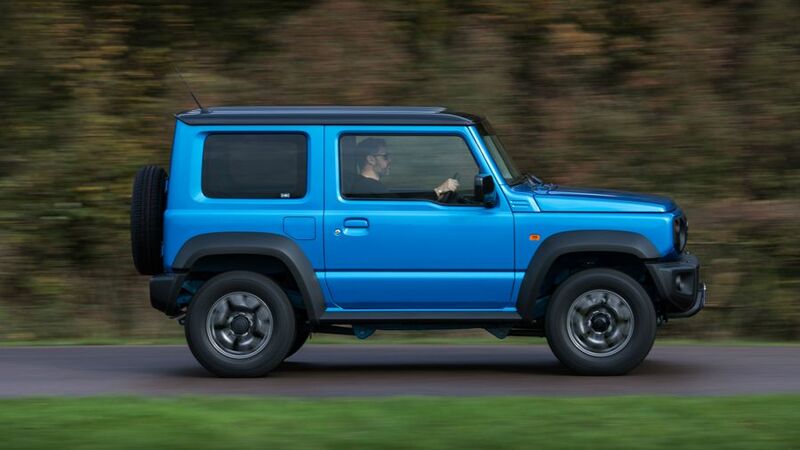 Our owner reviews are all uniform in their praise of the Jimny’s mechanical dependability, too, so that should give you even more peace-of-mind. Should anything go wrong, Suzuki offers a pretty standard three-year, 60,000-mile warranty. You’ll probably be encouraged by the fact that the Jimny comes with quite a bit of clever safety kit as standard. It includes an automatic emergency braking system that warns you of an impending impact and applies the stoppers if you don’t react, and a lane departure warning that helps prevent you from weaving around. Traffic sign recognition also comes as standard, as do six airbags and electronic stability control. Unfortunately, you might not be quite so encouraged by the fact that the Jimny scored only three out of five stars in crash tests by safety organisation Euro NCAP, despite all the safety kit. Even judged by the latest, most stringent standards, that’s a pretty poor showing. Two trim levels are available at launch, both of which are fairly high-end. The SZ4 comes with remote locking, cruise control, electric front windows, manual air-con, automatic headlamps and a stereo system that offers DAB, Bluetooth and a USB port. The SZ5 upgrades the infotainment system to include sat-nav and a smartphone link display, and it also adds climate control, a leather steering wheel and heated front seats. 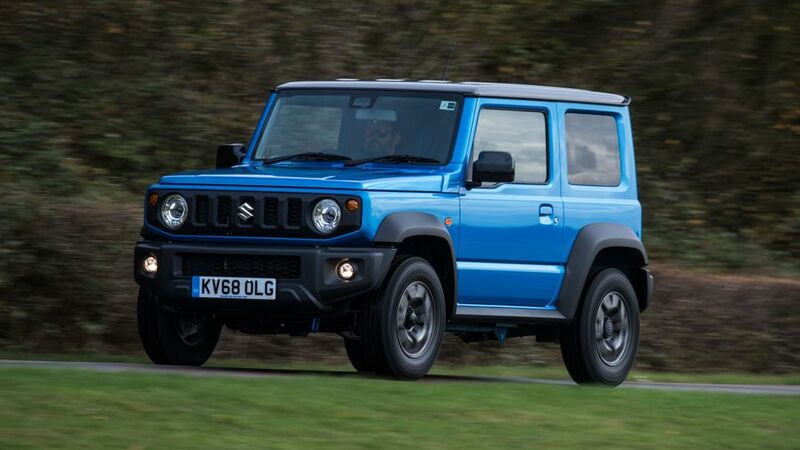 If you're after any creature comforts then the SZ5 is the car to go for, at a premium of around £1,500 over the SZ4, but if you only want your Jimny for its character and off-road ability, then the SZ4 is just as capable. The Jimny has developed a viciously loyal following over the years, due to its undeniable off-roading ability and its honest, no-nonsense charm. The latest version still has those virtues in abundance and for the hardened Jimny enthusiast, it’ll be the perfect evolution of the formula. However, that’s a pretty small audience, meaning the Jimny’s appeal is rather niche. For most other people who just want a stylish alternative to a regular hatchback, a more conventional small SUV – like a Renault Captur, Kia Stonic or Dacia Duster - would make much more sense.